Learn. Connect. Commit. Act. That is the general thrust of this year's Mandaue Business Movement (MBM 2010) and also for the One Cebu Sustainability Summit 2010. After the recently concluded Mandaue Run for Life 2010, the One Cebu Sustainability Summit 2010 will be on August 9, 2010 at the Cebu international Convention Center, Mandaue City. 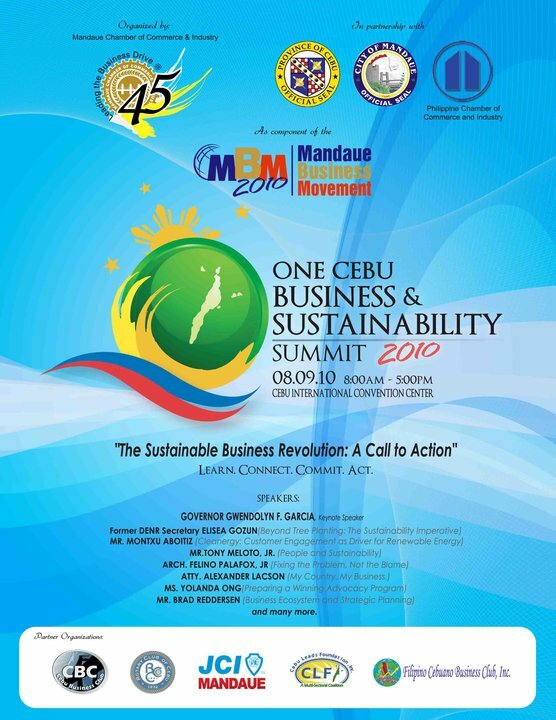 One Cebu Sustainability Summit 2010 will be attended by top business executives, the business summit has the theme "The Sustainable Business Revolution: A Call to Action". The intent of the summit is to leave the participants with an understanding of what they need to do to contribute to sustainable development and the strong commitment to do something about it. The Sustainable Business Revolution: A CALL TO ACTION! Experts agree that making the shift to a sustainable business economy is critical to the future of the Philippines and the world. Without making that leap, the environment we so cherish will continue to deteriorate at an increasingly rapid pace, which in turn will affect the quality of life for all of us. by taking on the challenge of "Becoming Sustainable", we as a business community can reverse that trend and truly create a lasting legacy of sustainable long term growth for business, our community and the natural world around us. Making that happen requires a "revolution" both in thinking and in action on the part of business leaders throughout the world. In this first of a series of summits, the Mandaue Chamber of Commerce and Industry will be hosting in 2010 and 2011, you as an attendee will have a unique opportunity to join that revolution and build a sustainable business legacy or your company, you community, and our country. What will I get if I join this event? LEARN why sustainability is so important and what you need to do to make the transformation in you own business. CONNECT with major business leaders who have made the leap to sustainability and who can help you with your own challenges, as well as with other attendees around you who may provide unique partnership opportunities going forward. COMMIT to specific steps you company needs to take to move into this new world of sustainable business. ACT on the first of those steps you just committed to, so that when you go back to your company afterwards you are already moving toward your long-term goals. CEOs and other Senior Executives within corporations, Senior Government Policy Managers, Investment Executives, Educational Leaders and members of Business Support Organizations. Varied talks from Environment, Technology, Energy, Business, Social Development and to Advocacy given by prestigious speakers! Like: ALex Lacson, Antonio Meloto, Jr. and many more! One Cebu Sustainability Summit 2010 is organized by the Mandaue Chamber of Commerce & Industry and in partnership with the Province of Cebu, Mandaue City and the Philippine Chamber of Commerce and Industry.